Texting while driving isn’t a very good idea but most people still do it. It’s easy, your phone is likely RIGHT THERE so why not fire off a quick message on a long stretch of road? If you get the urge, fight it because you don’t want that text to be the last before your car gets totaled or worse. 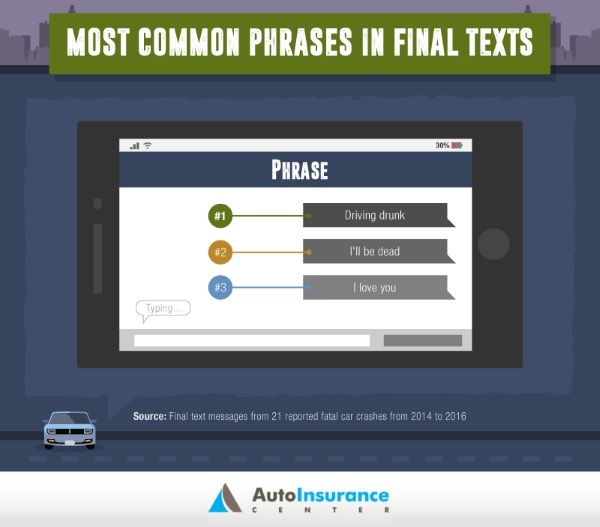 They Auto Insurance Center put together some chilling reminders why we should forgo those texting urges. The company looked at a variety of statistics but the one that was most gutpunching was the last messages before people were in accidents. Topping the list was a notice that the person was going to be late and in fatal crashes, that they were driving drunk. This is a sobering reminder that our little conveniences can come at a heavy cost if not used responsibly. Although the number of sampled texts was much smaller than what could be considered a legitimate study, this small sampling still goes to show how a small act can have devastating consequences. Check out the site for all the stats.